Over the last few weeks GFC research division has been looking carefully and listening to members requests about updated info and greater direct access to it and officers. Division Boards have been place around the sims for Personnel, CDO, Medical and the Academy at present, these boards show when members of that division are available and can be called directly by clicking on their picture if they are free and have signed into the board. This makes it easier for people to know who's available at a glance. Also as an early test a live GFC calendar of events and division lead lists has been place. 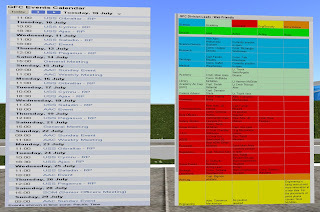 The boards use web on a prim live shared media in V2/V3 compatible viewers like firestorm to show web based documents in world. Users who use V1 style viewers like phoenix wont be able to view web on a prim, instead you simply get a texture on the board which you click to be given a link to view the content in your web browser. The calendar is the same as you see on this blog as is the division lead list, The lead list tracks which leads are in which positions and the calendar shows the times and dates of events happening. The advantage of using web based data is the speed of updates. The moment your aware of new information it can be added without the need to even come in world, quick and easily, the latest info you put in will be ready to view almost immediately. Division Boards can be found in the sandbox, outside the Academy, CDO, Quarks in DS19, Personnel and will be rolling out elsewhere around the sim with other divisions being added. The calendar can be seen in the sandbox and the Division Lead List is available in the sandbox and outside the CDO office, other locations may be added later. Boards Texture if viewed in V1 viewers like Phoenix, click to load in your chosen web browser. More items are in development which will push more information to the members and guests when they need its so watch this space.